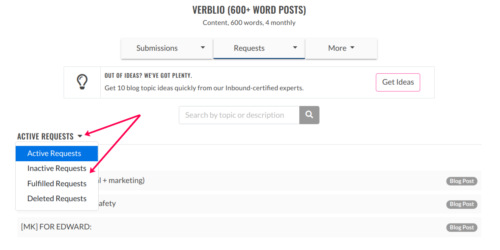 Editor’s Note: At Verblio, we know that creating spot-on requests is by far the best way to receive posts that meet your expectations. This post was originally published in January of 2015, so we thought it was high time to make a few updates and ensure that you have the most relevant advice and best practices possible. These are two of the most common FAQs we get here at Verblio (formerly BlogMutt). Fortunately, we’ll lay out how to be successful within the Verblio system using requests (formerly called ‘topics’). Requests tell writers the types of posts you want to be written and tee up writers to provide content that meets your expectations. Lots of requests, lots of submissions. No requests, no submissions. It’s that simple. What is a Request? A Quick History of Verblio Content Creation. Over the years, Verblio’s content creation terminology has taken multiple forms, shifting from ‘keywords’ to ‘topics’, to ‘requests.’ This progression is the result of search engines improving their search result technology as well as Verblio homing in on the best practices for providing businesses and agencies with top-notch content. Keywords are words or phrases that describe your product, service or area of expertise. Over time, when someone searches on Google, your site could be eligible to appear as a search result based on the similarity of your keywords to the person’s search terms. In the old days of search (WAY back before about 2012), it was very important to have keywords be an exact match to what searchers might enter into Google. Now Google (and other search engines) can provide search results within the context of the keywords you’re searching. For example, you could have a page that’s all about food, ovens, stoves, counters, sinks, cabinets, appliances, etc., and never mention the word “kitchen” and when someone searches for “kitchen,” they’ll still find your page. Google’s gone beyond exact keyword matches to the meanings and intent behind the keywords to help people find what they are searching for. If you do not have any keywords, you’ll have to get started with some research. You should consider using some popular blogging tools to get you off on a good foot. For more information about how keywords work, here’s a great article from SEO expert Moz, describing how to go about setting a keyword strategy. So, Where Do Requests Come In? 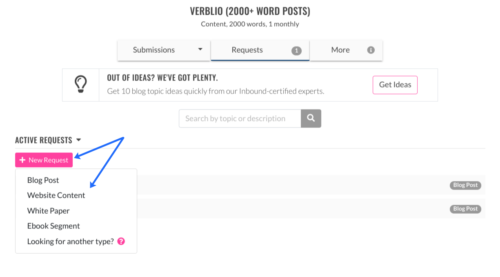 In the early days of Verblio, customers entered keywords into our platform to request content that hit on those exact keywords. Since search engines evolved to understand the context of keywords, we evolved as well. While keywords are still important, what’s even more important is just writing lots of great, relevant content that’s along the general themes, or topics, of what your business is all about. If you have good content, people will share and link to it, leading to increased page authority. Thus, customers entered topics into our platform which could include keywords or cover broader ideas to interest their readership. Nowadays, we’ve streamlined the process for both customers and writers as keywords and topics are both encompassed in a request. 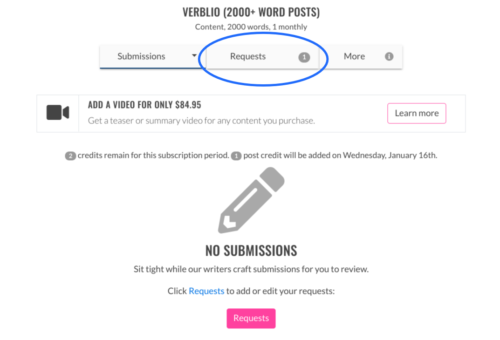 In the Verblio platform, you must submit requests to receive this content described above from our crowd of writers. Upon signing up with us, we will collect information about your company and the type of posts you want to write about. 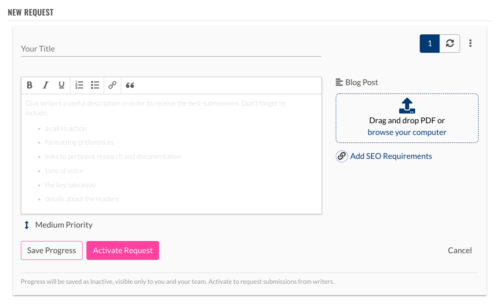 Once your account is set up, you must enter requests to start receiving content. Don’t worry about getting hung up on creating the “perfect” request. As you work with us, you’ll realize that the request process is a cyclical one–changing with your needs, your customers’ needs, and the seasonal needs of your business. 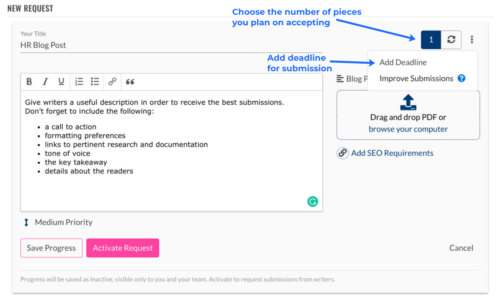 Get the engine started by entering a couple requests and try to tell the writers exactly what you want your post(s) to be about, and be as detailed as you possibly can. You can always change them whenever you’d like. No request is permanent. You’ll find over time that certain requests will resonate better than others with your audience. How Do I Add a Request? If you don’t yet have requests in the system, you’ll be alerted to that fact when you sign in. There’s a little red exclamation mark for the subscription(s) that need requests. Click on the Requests button to get started. Here, you can manage your active and inactive requests, and add new ones. 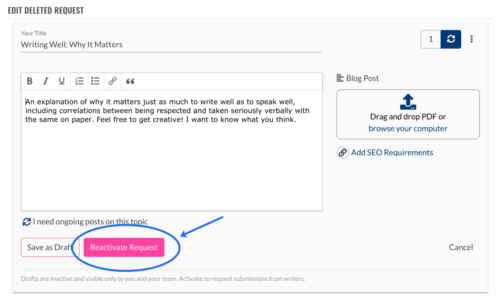 Add a title for your request and then use the description field to explain what type of content you’d like to receive. Make your description as specific as possible; the more direction you provide, the better our writers can align themselves with your expectations. Don’t forget to use our formatting menu to ensure your request is clean-looking and easy for writers to view! Do you have a few resources for our writers to read or cite in their posts? 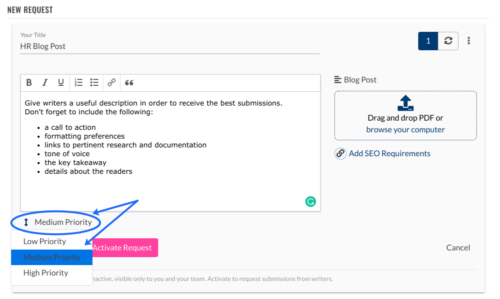 Either insert links into the request description field or upload PDFs to the request. How many pieces of content do you want to receive? icon, we’ll ask you to specify exactly how many posts you’re planning to publish on this topic. You can choose an exact number or choose to continually publish on this topic (formerly known as creating an ‘ongoing topic’). 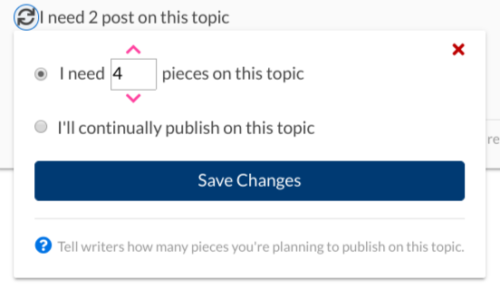 If you specify that you need an exact number of pieces on your topic, your request will remain active until you “accept” those posts. If you choose to continually publish on the topic, remember that your request will remain active until you delete it (just like an ‘ongoing topic’). The Requests page shows all of your Active requests by default. You can view all of your Draft, Active, Fulfilled, and Deleted requests by using the drop-down menu. The numbers that appear next to request titles indicate how many posts you have received. A green dot will alert you that a brand new submission is waiting for review. How do I edit, deactivate, and delete requests? When viewing your Active Requests, simply hover over each request to view, edit, or delete it. When editing a request, keep in mind that it’s best not to change a request to something entirely different–just delete or pause it (more on these next!). If you don’t want to receive content on it anymore, then add a new one. Changing a request also changes it in the posts you have in your queue on that topic, so you could end up with posts that don’t make sense with the new edits. 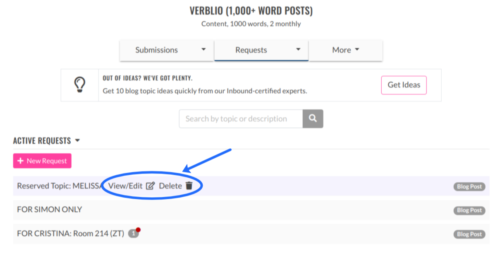 Be sure to delete any requests that might not apply to your business as soon as they become irrelevant; otherwise, our writers will keep submitting posts for those. But don’t worry, you can also re-activate deleted topics if you change your mind at a later time! How Do I Get Posts That Meet My Expectations? The Request template is endlessly helpful in providing writers with context for your requests. 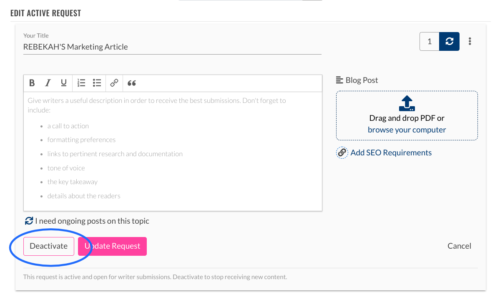 Submitting requests with context gives more direction for writers and higher quality posts for you. No matter how picky you are, if you have a specific idea of what you want from a post, this box is your best friend. 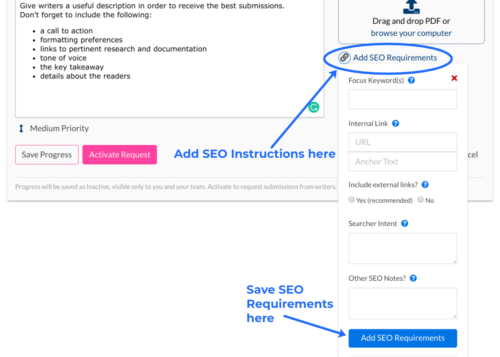 Use your requests to provide our writers any information that will help them write a post that will meet your expectations: SEO keywords, major points the post should make, examples, or resources you’d like the writer to reference, for example. You can even provide direction on tone or point out specific information to avoid. Feel free to link to an article or attach a PDF document/picture/outline to give writers as much information as possible. The more context and background you give to a topic, the better the posts will be. If you’re still not sure what requests to start off with, we have a few ideas to help you crank out fresh ideas. And if you’re really drawing a blank, there are plenty of content idea generators to begin the process. Fresh topics = fresh content. Stale topics = Stale content. Avoid getting similar posts or content you’ve seen before by adding more requests, updating your active requests, and deleting requests that feel overused or old. And don’t forget: As your blog matures, posts will get buried, and it never hurts to revisit requests with new information. What Do I Do for Requests That I Need Posts on ASAP? Whenever you want a request to take priority before any others and need it same-day or next day, set it to “high” priority. Please note that only specific requests for one piece of content can be set to high priority, so make sure the “1” icon is highlighted orange. Next, contact support[at]verblio.com to get our writers busy. Tell us when the post is due and we will reach out to our writers. We’re here to help! Be sure to keep these instructions on hand for your next tight deadline. 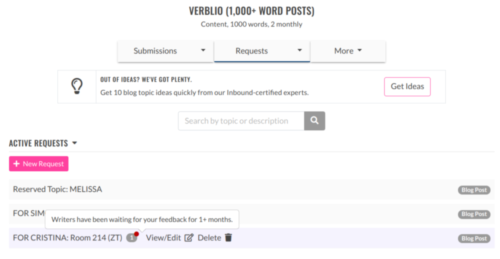 My mission is to help customers and writers get the most out of the Verblio platform and make sure their experience with us is amazing. I’m here to answer any and every question about our services. Outside of the office, I love solving jigsaw puzzles and knitting. I also do my best to get outside and enjoy some of my favorite Colorado activities: hiking, running, and skiing.